'We're Not Them' — Condemning Charlottesville And Condoning White Resentment : Code Switch A scholar and a journalist offer context and analysis on the events in Charlottesville and the politics of white anger. 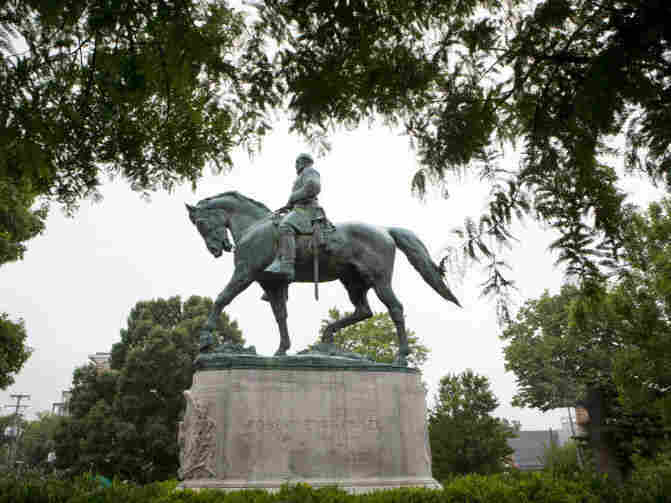 White supremacists descended on Charlottesville, Va., to protest the pending removal of the statue of Robert E. Lee in the city's Emancipation Park. What lessons does history teach about white resentment in the United States? How is the experience of other countries and other times — like Germany — relevant? How are those in power reacting to President Trump's shifting response? What was your reaction to the events in Charlottesville? Carol Anderson: Unfortunately, I wasn't surprised by the violence because white supremacy requires violence. What I was absolutely heartened by were the group of students from U.Va. who, although surrounded by torch-bearing white supremacists hollering at them, stood tall and stood firm, and all of those who came out and protested because they want the America that is the one we talk about, the one we aspire to be, not this devolving mess that has always been broiling underneath. But Trump really brought it out. Jamelle Bouie: I was not surprised at the fact that there were fights and clashes and skirmishes between the protesters. And the interesting thing about living [in Charlottesville] is that everyone knew the rally was happening. So you could even feel in the air as it approached, the kind of nervousness about the potential for violence. There was a rally from the Klan in July. And even though there were only about 50 Klansmen, and they were dwarfed by the number of demonstrators, even then you could sort of sense the potential for violence if there were any more Klansmen there. But I was shocked by the use of a car to attack protesters, counterdemonstrators. And I was — to a degree, still am — a bit shellshocked by the fact that someone was killed. People are comparing the events in Charlottesville to the rise of Nazi Germany. Carol, do we have to reach as far back as Germany in the 1930s to find examples of what we saw in Charlottesville? Anderson: Oh, no, not at all. I thought of the images coming out of Charlottesville this weekend, and it reminded me of Little Rock in 1957, when nine black honor students went to integrate Central High three years after the Brown decision, and the mob came out in force to stop nine black children from getting an education. The other thing that struck me and gave me a sense of Birmingham during the Freedom Rides, which is when African-Americans and whites were riding interstate buses — when they got to Birmingham and they stepped off of the bus, they looked around, and then whites attacked — just started beating. Or when I think about Birmingham blowing up — there are these leitmotifs that keep echoing through in America. And so we call them Nazis. And the reason why it's easy to say Nazis is because we don't feel complicit in that evil. That makes it much, so much harder than when we talk about these folks who love the Confederacy. And so we've gone to calling them Nazis or to strip the reality of who they are out of that language by calling them alt-right, when what we really mean [is] they were white supremacist. Can you talk about what you think white nationalists, like the ones in Charlottesville, expect to accomplish in 2017? Anderson: To me, what they want to accomplish — I mean, and you heard it from David Duke when he said that here in Charlottesville, 'We're filling Trump's promise.' When he talked about, 'make America great again,' what they really meant was make America white again. And I'm putting an asterisk by that because what that really means is to create a society where the resources of the society funnel into a whites-only space, but that it is propped up and supported by a vast labor pool without rights. What role do white nationalists play in feeding and aiding those goals? Anderson: Oh, they are absolutely essential to it. When Trump began his campaign saying that Mexicans are rapists and criminals, he was sending the signal to those white nationalists that it was now their day, that they could begin to act and to say the things that they felt had been forbidden for so long because of the change and the norms brought about by the civil rights movement. Bouie: They also serve the purpose of distancing people from the everyday, more policy-based instances of racism and racial discrimination. So, in the wake of Charlottesville, you've seen Republican officeholders, excepting the president, condemn the white supremacists in Charlottesville, condemn the violence, explicitly label the white supremacists as white supremacists. But these lawmakers who did this, whether it's Orrin Hatch of Utah or Marco Rubio of Florida or Cory Gardner of Colorado, none of them have spoken up against voter suppression regimes in Republican states. And what the white nationalists sort of do is, they provide a way for more mainstream figures to say, well, we're not them, therefore we reject racism and then kind of quietly accept a policy regime that entrenches racial inequality, that effectively denies the rights of citizenship to millions of Americans. Aleli May Vuelta of the Code Switch team contributed to this report.